From retro cinemas to a state-of-the-art planetarium, when it comes to film showings, Singapore has it all! Check local listings to find out what’s on during your visit to Singapore – you’ll find all sorts of performances from dance festivals to plays to Broadway musicals. 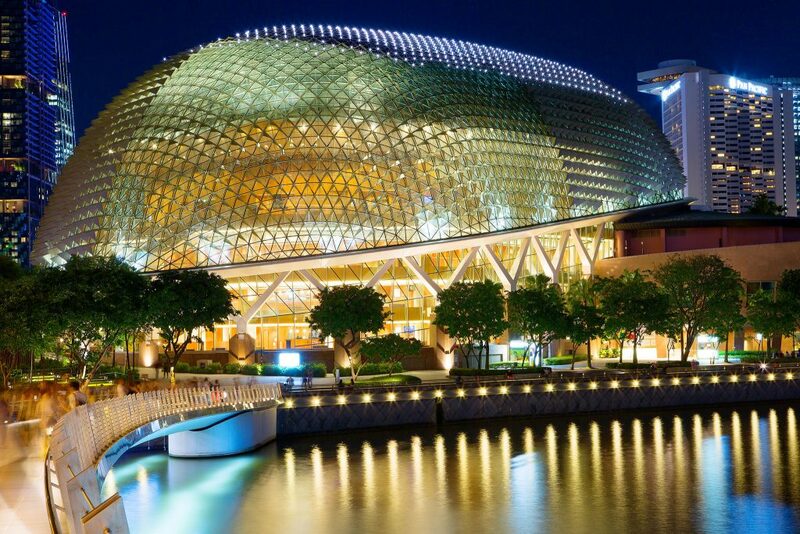 The Esplanade is one of Singapore’s most iconic and most easily recognisable buildings. Constructed entirely on reclaimed land, the building, with its two rounded glass domes is spread over an area of some 60,000 square metres. The domes are fitted with more than 7000 triangular aluminium sunshades! Why not take a tour, to find out more about its unique architecture and its day-to-day workings? As well as showcasing the performing arts it is also a thriving centre for shopping, entertainment and dining. Since it first opened in 2002, the Esplanade has transformed Singapore’s arts scene, drawing in locals and visitors to annual festivals as diverse as Bay beats, da:ns festival and Huayi – Chinese Festival of Arts. This contemporary theatre, set in the Marina Bay Sands area, combines cutting edge technology with lavish interiors. It seats 2,155 and is the venue for concerts by local and visiting artists as well as for Broadway musicals. The grand Star Theatre showcases the productions of the Star Performing Arts Centre, with its state of the art audio-visual systems. It seats 5000 but feels so much more intimate with its traditional horseshoe shape auditorium. The top row of seats is, incredibly just 56 metres from the stage, so you definitely won’t miss out on any of the action! Singapore is home to some really unusual cinema venues – perfect for catching a local film or your favourite art-house movie. The Projector had its heyday in the ‘70s, when it was Singapore’s largest movie theatre. In 2014 it was renovated and reopened, maintaining charming details, such as the original tip-up seats with their wooden armrests. You can find it on the 5th floor of the historic Golden Theatre. The Screening Room is a contemporary cinema with an unusual twist – you can combine dinner with a film, and all of the menus are customised for whatever is showing that week. Perhaps the ultimate movie experience! Enjoy a pre-film aperitif or a post-film debrief at the La Terraza Rooftop Bar. The Omni-Theatre is a unique planetarium which holds the distinction of being South-east Asia’s largest seamless dome screen – some 23 metres in diameter. It offers the full edutainment experience with a mixture of films and live shows conducted by educators from the Science Centre Singapore. Travel to the furthest corners of the earth, visit outer space or voyage under the sea in this incredible, immersive experience. This is an unforgettable experience for all the family.